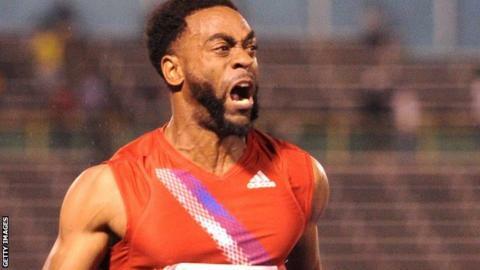 Sportswear manufacturer Adidas has suspended its sponsorship of sprinter Tyson Gay after the American failed a drugs test. An out-of-competition test completed by Gay in May tested positive, according to the US Anti-Doping Agency. "We are shocked by these recent allegations," a spokesman for Adidas said on Monday. "Even if we presume his innocence until proven otherwise, our contract with Tyson is currently suspended." Gay, 30, is the joint-second fastest man ever over 100m. He is also the fastest man in the world this year and won gold in the 100m, 200m and 4x100m at the 2007 World Championships. The sprinter is awaiting the results of his B sample and said on Monday: "I don't have a sabotage story... I basically put my trust in someone and was let down. News of Gay's positive test emerged as fellow sprinter Asafa Powell was also revealed to have failed a drugs test. Women's discus thrower Allison Randall on Monday confirmed a positive drugs test from the Jamaican trials, the same day police in Italy raided the hotel rooms of Powell and Sherone Simpson - who has also tested positive - and took away unspecified drugs for analysis. British sprinter Craig Pickering, who is currently training with Great Britain's bobsleigh squad in a bid to reach the 2014 Winter Olympics, was part of Great Britain's 4x100m relay team that finished third at the 2007 World Athletics Championships behind an American team featuring Gay and a Jamaican team containing Powell. "Powell and Gay were people I looked up to in the sport," Pickering, 26, told BBC Radio 5 live. "I raced them lots of times and never beat them. If they have been doping [throughout their careers], I have lost out financially. "In 2007, I would've been a world champion and that would've been a life-changing moment." Denise Lewis, who won heptathlon gold for Britain at the 2000 Sydney Olympic Games, is pleased the testing system is working but wants athletes to be given more information on supplements. "I feel very let down, but also relieved as it does not matter who you are, you will get caught," she said. "Every athlete would appreciate a comprehensive list of supplements they can and can't take so there's no room for any doubt. "But if you do not know what it is, you should not take it." Roger Black, a silver medallist in the 400m at the 1996 Atlanta Olympics, does not sympathise with athletes who fail a drugs test and believes it is up to them to ensure they do not take a banned substance. "It's about the athletes taking responsibility for their own careers," he insisted.